My family is not big on drinking soda pop. However, I do keep a 2-litre of lemon-lime in the pantry, for tummy troubles. A problem arises when we don't finish off the entire bottle before it goes flat. Then we're left with a bottled beverage that no one wants to drink. The same thing happens during the holidays when we open a 2-litre of cola. My family will drink the first half of the bottle, but leave the rest untouched. I have found a couple of ways to use flat soda that appeal to my family members. 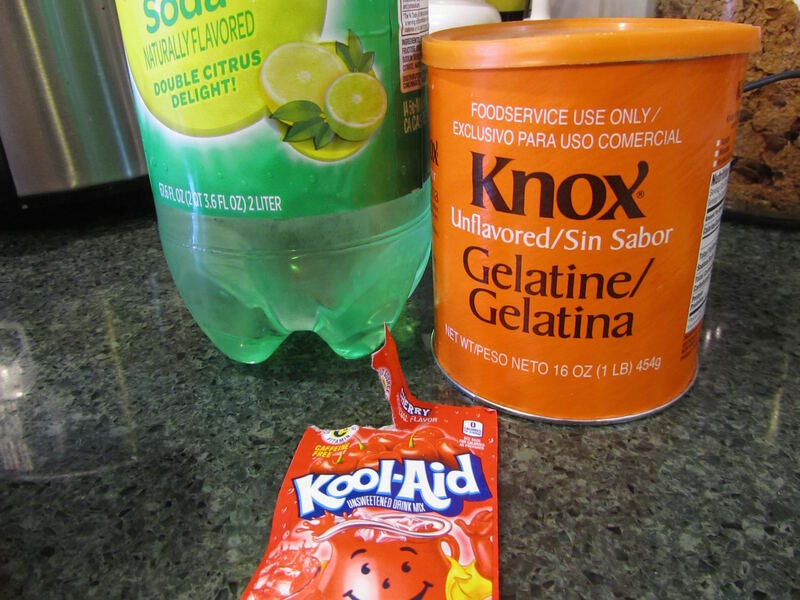 The first of these concoctions uses lemon-lime soda, gelatin powder, and unsweetened Kool-aid powder. I simply substitute the flat soda pop for juice or water/sugar in making the gelatin, adding a bit of Kool-aid powder (just a small amount, not the whole packet) for flavoring. The above photo is a gelatin salad that I made this week, using cherry Kool-aid, lemon-lime soda, gelatin, chopped fruit, and mini-marshmallows. The second concoction was modified from a recipe that I found online for slow-cooker barbecue beef. The online recipe called for ketchup, cola, and Worcestershire sauce poured over a beef roast and cooked in the crockpot. My modification uses browned ground beef (drained), with some ketchup, some canned tomatoes (drained of liquid), soy sauce, and garlic powder, then cooked in the crockpot for a couple of hours. I serve this over hamburger buns, like Sloppy Joes. It has been popular enough in my family that I was requested to make it again for tonight's dinner. We aren't big soda pop drinkers, either (in Michigan, we just call it "pop"). Great ideas! 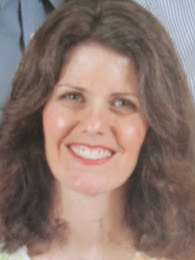 On a different note, I saw that you used the spelling "litre"--around here, we use "liter"--I know your way is a common spelling in England--is it a regional spelling where you are? Growing up in California, we called soda pop, coke. For instance, "would you like a coke?" "Sure. What kind do you have?" I once worked with a lady who grew up in Georgia. She called all soft drinks 'coke' also. It was the norm in Georgia, she said. That was the first time I'd heard that. Like Kris, here in Ohio, it's all 'pop'. I worked in Ohio several years ago and the medical facilities were using the "re" version--Health Centre, etc. 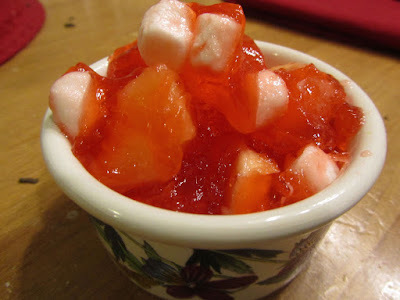 The gelatin looks really yummy with fruits and marshmallows. Lately, we've been adventurous making our own concoctions too, like kimchee added to rice, in the pot, instead of serving white rice and kimchee separately. 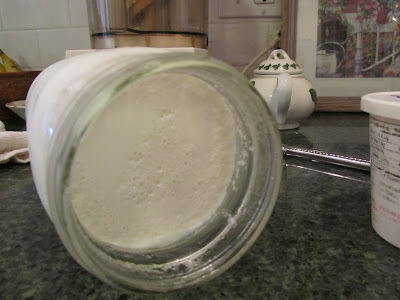 The reddish colored rice adds interest and didn't take more time, money or effort, using up the juice at the bottom of the bottle that otherwise would be thrown away. your kimchee in rice sounds tasty and visually interesting. What a good idea to use up the end of the bottle this way, as it might have otherwise been thrown out. I have lived various places where we used three different versions for bubbly, sweetened, liquid--pop, Coke, and soda. However, I've never lived where two words, soda pop, were used. I always find these regional differences interesting. regional variation in word usage is interesting to me, as well. I also like comparing British English to American English. The vocabulary differences can be surprising for some words, and sometimes confusing, such as "jumper" for "sweater." Do you have any good ideas for flat ginger ale? My daughter was sick last year and we gave her small bottles but I see they are now in my pantry. Nobody in my family drinks much "pop" or "soda" either so I need a good use for that ginger ale besides pouring it down the drain. flat ginger ale might be good combined with water in making tea. I would try steeping a black tea bag in half and half water/ginger ale, then maybe add some cinnamon and cloves, for a quasi chai tea. Just a thought. Also, the ginger ale might be a good base for a gelatin salad, just as it is or with a small amount of lemon juice added, then diced fruit or vegetables (such as grated carrots or chopped celery). Those would be my first experiments with flat ginger ale. Good luck! Did you know you can make a cake by using just a twelve ounce can of soda and a cake mix then bake as usual. Pick compatible flavors of course. Or, place a can of pie filling or equal homemade amount in 9x13 pan, sprinkle a cake mix over this then pour a twelve ounce can of soda evenly over this and bake like a cobbler. Quick and can use up odds and ends. We do that when we are camping--we use a cast iron Dutch oven. Canned peaches also work well. I've seen those recipes before. Do you think cakes would work with flat soda, too? The cobbler idea sounds like a great quick dessert idea. Thank you for this! Growing up, my Mom had a Jello branded 'cookbook' for kids. There were a lot of easy recipes using Jello and pudding. My sister and I often made dessert using this book. One of our favorites was the cherry cola Jello. You guessed it, substitute cherry cola for the water when making cherry Jello. It is very good. I've seen barbecue recipes using cola, but haven't tried it. I need to do that. Your recipe for Sloppy Joes sounds good. I think I'll try that also. 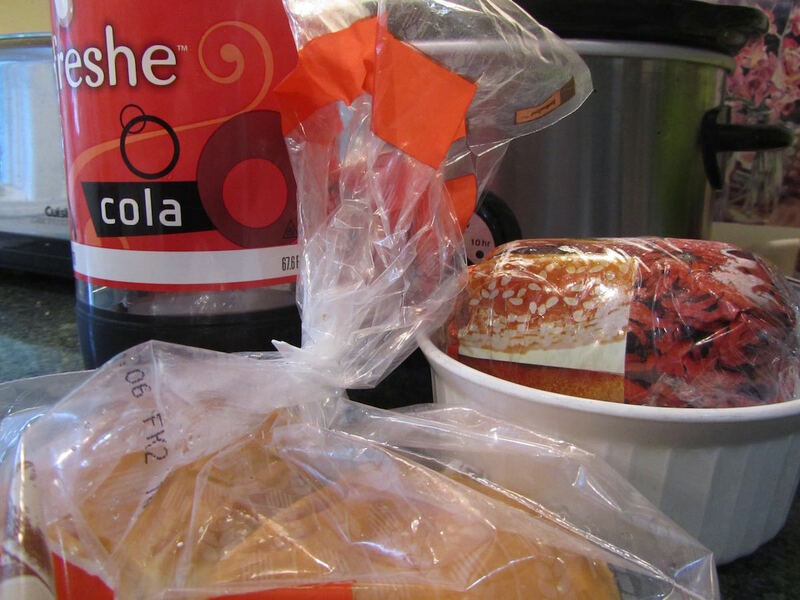 If I don't sue the last of the cola in another BBQ beef sandwich meal, I'll try making a cherry cola jello, adding the cola to cherry Koolaid and gelatin. I have some bottled cherries that I could add to that, too. Thanks for the idea! The crock-pot BBQ beef sandwiches are a hit in our house. They're very tasty. I hope you try them sometime. Thought of one more thing a friend taught my husband...when grilling burgers and you want to do a bit ahead but don't want them to dry out...put a can of cola in a slow cooker and turn on low....will keep your burgers, or other meat nice and moist. Flat soda is fine. Interesting idea with the cooked burger patties. When I worked in a fast food restaurant in high school, we grilled beef patties, then kept them hot and juicy in beef stock. Similar idea, just a different flavor. I'll remember the cola in a crock-pot idea.